As we enter the fall and winter seasons, the weather can change rapidly from pleasant to wet, cold and miserable. It is important to be prepared on the road, whether it is a short ride to your favourite coffee shop or a day ride. Unlike cars who are climate controlled, motorcyclists are exposed to the elements at all times and it isn’t as simple as turning on the heat when the weather changes. Here are a few items and things to be aware of to ensure you have a safe journey in the fall and winter seasons. You don’t always plan on riding in rain or in the dark, but anything can happen on the road. It is best to be prepared! First, you need good tires. 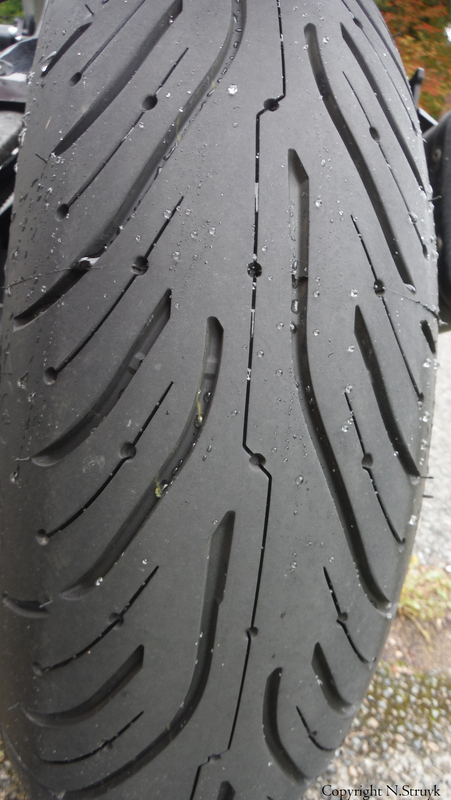 Because you only have 2 points on the road, the need for proper tire performance is paramount; if one motorcycle wheel loses grip, you don’t have another three keep you upright as you would in car. Make sure that your tires are in good condition. Incorrectly inflated tires may not allow the tire to function properly. If the tire is under inflated, the treads that would dispel water away will be smaller and will not properly disperse the water away. This has the same effect for well used tires with limited tread depth left. Both may lead to hydroplaning. If they are over-inflated then your contact patch on the road is smaller than suitable, decreasing your grip on the road. Old tires don’t have the same grip as newer tires. If your tires are nearing the end of their life, don’t wait until the spring to replace them. There is less room for error in the winter and shoulder months. Long underwear or under layers. Get a pair of thin light weight top and bottom layers will so they fit snugly underneath your gear. Snugly not loose enough that you can still move body and have the dexterity to operate the bike safely. You don’t want to be so geared up you have trouble doing shoulder checks or turning your handle bars. 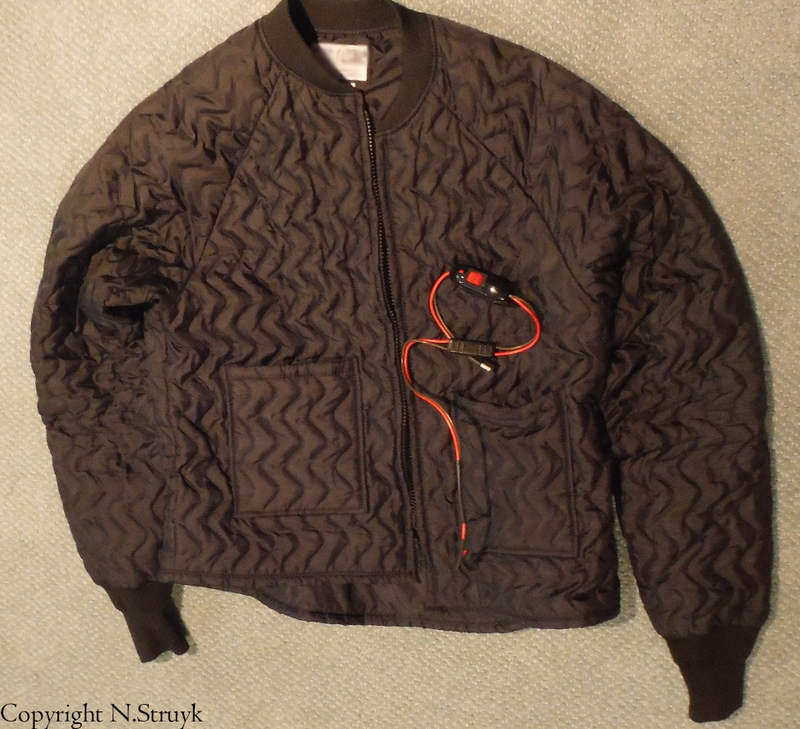 Merino wool or light weight fleece works great! The thinner they are the easier they are put into a tank bag if you are too warm. There are specific motorcycling ones, but brands from any outdoor store also work. Battery powered or heated socks also exist for more chillier riding days. Neck warmer. You don’t need a special motorcycle neck warmer – I use my neck warmer normally used for winter sports. I also have a light weight one that is good for the shoulder seasons. If you choose to be more fashionable, a scarf works too. I have a plethora of scarves so I can also look chic at the coffee shop or my final destination if I am going to meet friends. 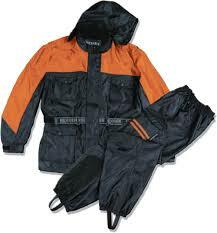 Rain Gear or Suit/Cold weather jacket. Some riding jackets are just fine for the colder seasons, some aren’t. Make sure you have the proper outer layer with a good liner and some water resistance or proofing. Having said that, investing in a good set of rain gear is extremely important. Good rain gear offers both warmth and water protection. Some gear is hi-vis which is essential in dark rainy nights. You can get both 1 piece or pants and jacket separately. I prefer separate as sometimes I just need a little bit of extra warmth on my core rather than the whole body. Gloves. If your hands are cold, nothing else really matters. You can’t control a motorcycle efficiently if your hands are freezing. A rider should have several pairs of gloves. I have ones for 3 seasons: summer, shoulder season and winter, it amounts to roughly 6 pairs but I have been told I need more. 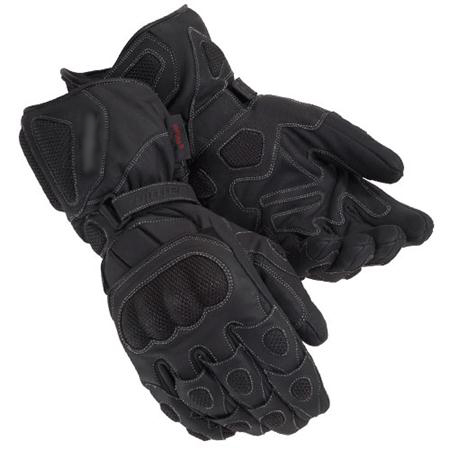 There are excellent winter weight gloves that are meant for cold weather riding and still give you the dexterity to operate the controls. It is good to bring a spare pair on longer trips in case the first pair gets wet. There are also battery powered gloves! Now, more electronic gear that can help: Heated grips. When riding in the early morning or late evening during the shoulder seasons, these are a hand saver. They keep the worst of the chill off your hands. They, however, won’t replace proper gloves for the season you are riding in. Also, for longer rides if you go through mountain passes, the air temperature can easily drop even in the summer. A quick flick of a switch and your hands are warm. There are many brands out there, but I caution you when installing them. Make sure that they are installed correctly such that when the bike is turned off and you accidentally forget to turn off the grips, it won’t drain your battery. It has happened to way too people. Heated vest/jacket: This was the best purchase I have ever made in keeping myself warm when riding in the shoulder and off seasons. They plug directly into your battery. I bought a toggle switch so I can turn the jacket on and off while riding. This isn’t essential but its easier than pulling over to manually unplug or plug in the vest/jacket if you get too hot or cold. They come as layers to wear under your riding jacket, or if you have the spare cash, you can get a winter weight riding jacket that has a heated layer. If you are in a pinch and don’t have proper gear, plastic bags for the feet and dish gloves or latex first aid/mechanic gloves for the hands will keep them. You certainly won’t win the most fashionable motorcyclist of the year award, but you will be drier and warmer than without. Regardless of what you buy, make sure the gear fits you. You don’t want gear to act like a parachute or be so tight under your gear that it pinches and you’re in pain when you ride. You need to be comfortable and still be able to operate the bike safely.